For a while I have been receiving e-mails from a good friend who has asked me to investigate something weird about the Birth Certificates. He wanted me to take a look at them because they have certain numbers and other things printed on them that need an explanation. When I looked at my own Birth Certificate, I noticed it was a copy of the original. So I went through old boxes and baby books that my Mom had saved before she died and found what I was looking for -- my original Birth Certificate. It was brittle and yellowed with decades of age but -- wow -- it was NOT the original! What I have learned since is kind of like discovering that you are part of the Matrix. It seems none of us have our original Birth Certificates -- they are all copies. And the copies have a serial number on them, issued on special Bank Bond paper and authorized by "The American Bank Note Company." Huh? It seems that back in 1913 the United States was short of cash. By the end of World War I, wartime costs had depleted the treasury and there were several really bad financial panics. The country needed to print more money than it had as equity to restore confidence in the money supply and get the economy back on its feet. When you or I need more money, we use something as collateral and go to a bank for a loan. When a country needs more money it has to go somewhere also. But in 1913 there wasn't anywhere to go. So the US created the Federal Reserve Act. This established a private central bank (The Federal Reserve Bank) that would regulate the amount of money the US government was allowed to borrow and put in circulation. It also would expect to be repaid, like any bank, with interest. After only 20 years things went from bad to worse. During Franklin D. Roosevelt's presidency, in 1933, the US was unable to pay its debt. The county was bankrupt. The private banks that made up the Federal Reserve demanded their money and Roosevelt responded. He had to use the only thing left of any value to pay the banks and continue doing business with them -- the citizens of our country. Us! Exactly how all this was orchestrated is too lengthy to be addressed here, but this much can be told. The original birth or naturalization record for every U.S. Citizen is on file in the official records in Washington, D.C. (you get to keep a copy!) and the property and assets of every living U.S. Citizen is pledged as collateral for the National Debt! Within two weeks and three days each Certificate of Live Birth is to be filed in Washington D.C. Evidence reveals that there is even a Federal Children Department established by the Shepherd/Townsend Act of 1922 under the Department of Commerce that appears to be involved in this process in some way. 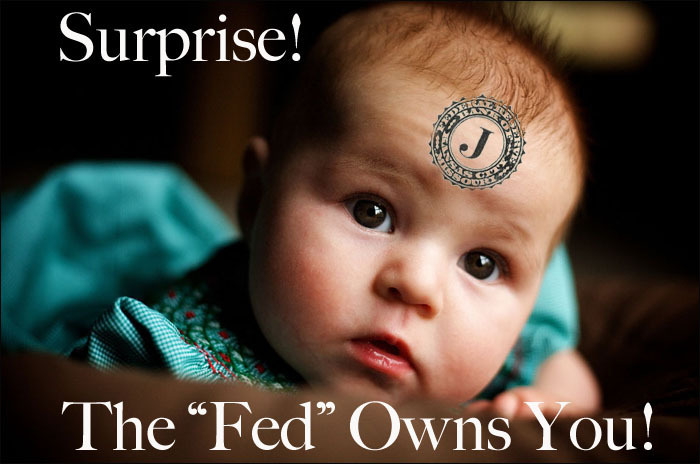 Every citizen is given a number (the red number on the Birth Certificate) and each live birth is valued at from 650,000 to 750,000 Federal Reserve dollars in collateral from the Fed. This kind of makes you feel a little different when you look at Federal Reserve Chairman, Nancy Yellen, doesn't it? OK. Let's take a pause to look at the Birth Certificates [below]. You will see the red numbers and you will see the fact that it is, in reality, a "Bank Note." Congratulations -- you and I are commodities! Since the early 1960s, State governments have issued Birth Certificates to "persons" with legal fictional names using "ALL CAPS" names. This is not a lawful record of your physical birth, but rather the acknowledgement of the "birth" of the juristic, all-caps name. It may appear to be your true name, but since no proper name is ever written in all caps (either lawfully or grammatically) it does not identify who you are. The Birth Certificate is the government's self-created document of title for its new property -- you and me! In a way, it makes us a kind of corporation whose company name is the same as our real name, but written in ALL CAPS. This "corporation" then generates taxes and wealth over its lifetime and in this way repays the collateral that Uncle Sam borrowed from the Federal Reserve. Remember that "Bond" thing printed on the bottom of the certificate? "Bond. 1a: A usually formal written agreement by which a person undertakes to perform a certain act (as fulfill the obligations of a contract) ... with the condition that failure to perform or abstain will obligate the person ... to pay a sum of money or will result in the forfeiture of money put up by the person or surety. 1b: One who acts as a surety. 2: An interest-bearing document giving evidence of a debt issued by a government body or corporation that is sometimes secured by a lien on property and is often designed to take care of a particular financial need." --Merriam-Webster Dictionary of Law (1996). Banknote. A kind of negotiable instrument, a promissory note made by a bank payable to the bearer on demand, used as money, and in many jurisdictions is legal tender. Along with coins, banknotes make up the cash or bearer forms of all modern money. 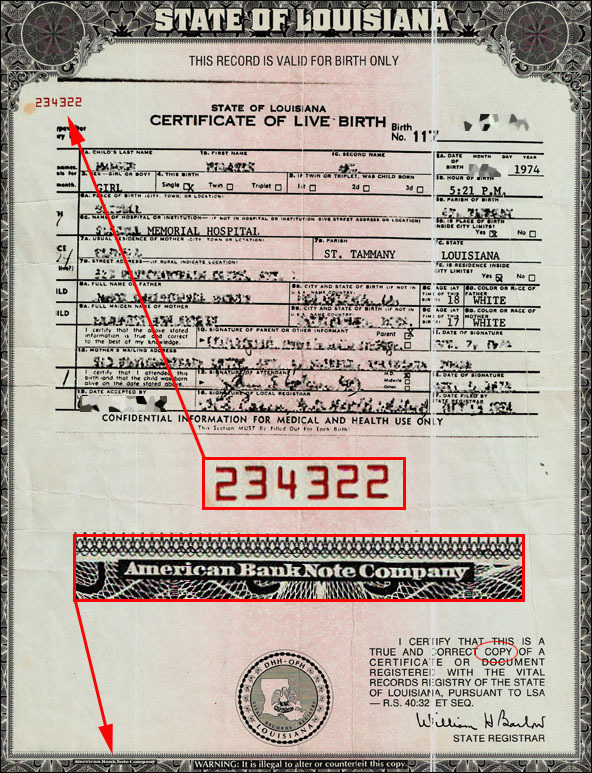 It is not difficult to see that a state-created Birth Certificate, with an ALL CAPS name is a document evidencing debt the moment it is issued. Once a state has registered a birth document with the U.S. Department of Commerce, the Department notifies the Treasury Department, which takes out a loan from the Federal Reserve. The Treasury uses the loan to purchase a bond (the Fed holds a purchase money security interest in the bond) from the Department of Commerce, which invests the sale proceeds in the stock or bond market. The Treasury Department then issues Treasury securities in the form of Treasury Bonds, Notes, and Bills using the bonds as surety for the new securities. This cycle is based on the future tax revenues of the legal person whose name appears on the Birth Certificate. This also means that the bankrupt, corporate U.S. can guarantee to the purchasers of their securities the lifetime labor and tax revenues of every citizen of the United States/American with a Birth Certificate as collateral for payment. This device is initiated simply by converting the lawful, true name of the child into a legal, juristic name of a person. Legally, you are considered to be a slave or indentured servant to the various Federal, State and local governments via your STATE-issued and STATE-created Birth Certificate in the name of your all-caps person. Birth Certificates are issued so that the issuer can claim exclusive title to the legal person created thereby. A follow up to your well written and very important investigative article. I just wondered why you stopped just short of telling the whole story to include what i will term the " Deception Contract Slavery Doctrine" that was adopted and put in place long before 1913 or the Fed or even subject slavery adopted even under the roman empire and earlier cultures of time. Our Republic system was designed to prevent it by placing the option of being a exempt citizen which are Article 4 Section"The Citizens of each State shall be entitled to all Privileges and Immunities of Citizens in the several States". To things become clear from this reading which first point is that a natural born citizen has "all Privileges" and can become president of the union of states with a capital in DC. as no other citizen by law legally lay claim to this office it is a special class of citizen. The second is that we have this Privilege by way of an entitlement that can be used to contract these "Privileges away for an assumed enrolled benefit." This was set up by the 13, 14, and 15 amendments are asset of a hidden banking power structure "Beast" if you will and uses greed, fame, promotes morally detached behavior and indulgences all a fixture its plan to rule the people of the world i.e., Rule the world One world Order folks we are all so fond of these days. Oddly enough as surely as those families and organizations who have worked this plan many times and on many continents down though the Ages. They don't seem to be to shy at admitting what the plan is to those they think they can corrupt, and turn to the Dark side of Materialistic greedy behavior. These clever people and those who help them progress against the Natural Born Citizen is that every step to deny these Persons of Interest, their pound of flesh and become here is my most favorite word Immunities of a Natural Born citizen as opposed to a Article 14 Subject Person under the Jurisdiction of All Governments. Approached from this point of view it becomes plain to see that most of the free people have become tricked into become property by way using British Laws of Admiralty in trading as a structure by moving it from the sea to the land via commerce exchanges and assignment of vessel property from birth to grave by the laws of contract. Therefor the answer to both the immediate problem of the lions, tigers and bears statement "OH GOD we are Freaking Slaves traded by criminally sneaky people with a money making printers pushing us around because we are ..... drum roll please... really Ignorant of the truth of who we are. We who are Natural Born Citizens are very powerful in this republic and not because we can do this or we can do that. We are powerful because we are born with all immunity. In short what can not happen to anyone rich or poor it can not happen to us. We are immune free from oppression, free to act in commerce in any way we feel necessary and no one can impede us as we are immune to all civil law as a code of commerce yet can apply any law of commerce to aid and abed our action without fear of reprisal without a complaint, grand jury under common law for crimes. I have known this for a very long time. So the questions that truly need to be raised are: what type of person are you? what kind of citizen are you? are you a slave or not? do you have a choice? The Good Book says you cannot serve two Masters, right? So whom do you serve? Are you corporate because they say you are a legal person or are you a natural born person who has God given rights. You see when you pick up the banner of legal person you have supposedly waived your rights for priviledges. It up to you and all of us to announce what kind of person you are. Unfortuantely for most they have most of us in lock step with the Uniform Commercial Code and the law of contracts. A Birth certificate (registration of birth) is nothing more than a Contract. Did they tell you you were signing a contract. Did you know you didn't have to register the birth? What ever happened to the family Bible and the recording of births? If you think this has all happened by accident you are mistaken. The "banks" own you and all you own. Don't pay your real estate property taxes and your house is paid off,,,,,guess who really owns it. Your car is never owned by you.....the State owns it. Don't tag it and watch who gets it. There is a very good book that everyone needs to read.....The Creature from Jeckyll Island by G. Edward Griffin. The founding of the Federal Reserve. It doesn't end there. The FED in not a bank owned and controlled by the U.S. Government. It is owned by International families. So to take it a step further you are owned by foreigners. You body has been collaterallized and a bond has been issued on all your future earnings, your children and all their future earnings. Did they explain this to you in Public School? I think not! Isn't finding out the truth such fun? It kind of takes the steam out of your focus....dont it? There is so much more to understand how our own U.S. government has swindled the American people. Did you know there are three definitions for United States in Black's Law Dictionary? Why so many? The first two are corporate the third is the united states of America, under the Constitution. Gosh I guess that means the other two are not...........how profound. By contract these bastards can do anything they want and not have to worry whether or not something is Constitutional. When they do they are only giving lip service. When you exchanged your signature on your Social Security Card you exchanged your natural rights for a future economic benefit and is so doing you contracted away your so called freedom. Are you required to have a SS number? No.....is it any wonder Mexicans can come into the Band of America and open an account without one. What are we going to do about all this when most folks don't even know they are not free? Only God can help us at this point.. Please join in and pray that he will hear our plight. PS> The book of Revelations also speaks and too the oceans will be the color of blood. Remind you of the red oil slick even the scientists cannot figure out what causes it........other than oil. Dear viewzone magazine, you are doing a fine service to those who want to know more. Whoever is not curious these days is missing a basic part of being human. Thanks again for this brilliant and utterly digestible (for a non-US citizen) piece. I hope there will be one or the other comment of serially numbered fellow slaves. Come on people, stir a little to show you are alive. Fantastic Article! I have been studying this as much as possible, and most of what I find can become a little confusing or just doesn't have the ring of truth. This was easy to read, and although did not impart new knowledge for me, it put it together in a way that makes it very easy to share. I have made the personal decision to find out as much as possible about correcting this slavery of the soveriegn. Not just for myself, but for others. The one thing I have been unable to find is a easly understood solutions to each aspect of this problem. As this is only the litteral beginning "birth" of the trickery in play. If you have any step by step solutions and or suggestions, please do a piece on that, I would love to use and share. Of course if you have the chance you could email me back. It just gets so confusing with the maritime law, jurisdiction, etc. I have seen alot of conflicting or at least not congruant information. Gotta have my own flag, my own seal, sign stamps to become my own postmaster, remove the house numbers from my address, pick up my mail don't have it delivered, get rid of my Drivers License, etc, etc. Yet what I have not found are the obvious solutions to the issues created by some of these steps, if even they are necessary. Not to mention... can a soveriegn even vote? How do you get around jobs that want a social security number? How do I stop them from deducting social security insurance, medicad, medicare, and the debt owed to the Fed Reserve they take out called Federal Income Tax? I could use alot of help with this, as well as others. I appreciate this post and any help you can provide. Demand from your bank or brokerage, lawful money and the tax goes away, with a tax exemption on lawful money, all of your money is yours.